The Healthy Vegans: The Label Lies! The labeling laws are so ridiculous it constantly surprises me what companies get away with on their packaging. We might as well disregard the nutrition label all together it has become so misleading and unscrupulous. Take Vegan Parmesan for example. The label says 0 grams of fat, but the calories from fat are 5 out of 15 = 33%, this product is 1/3 fat, yet the labeling laws that let them round down show 0, but this jar has 25 grams of fat in it (assuming 9 fat calories per gram of fat 45 servings * 5 fat calories per serving). 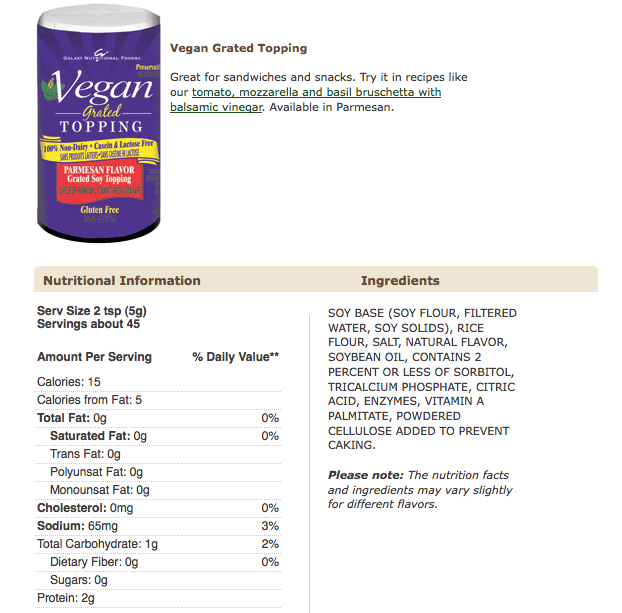 While I don't mean to say this is a bad product, its used fairly sparingly as a topping expect some recipes call for quite a bit, I'd skip it for something else in those cases. i love posts like this. you sent me a youtube video once about this guy talking about the fat breakdown in a carton of veggie broth labeled "90% fat-free". the thing wound up being "65% fat" or something like that. it's disgraceful. thanks to you, we stopped using oil spray. "0 grams of fat"....pfff! What really creeps me out is rounding down trans fat. People eat things like peanut butter expecting no trans fat but they can be getting something like 12 grams per jar.